The Annapurna Short Trek in Annapurna Region offers an unforgettable life time opportunity. You can experience the High Mountain and low land village climate and culture. Because of the diversity in the region in terms of both, landscapes and ethnic group living in the region and along the trail. Some of these ethnic groups are Gurung, Magar, and Thakali. Bharal Adventure’s travel planners have researched thoroughly before creating this trekking holiday. Himalayan walking activity is definitely an intrepid act to do. Therefore embark today for the mesmerizing walking holiday in Nepal. 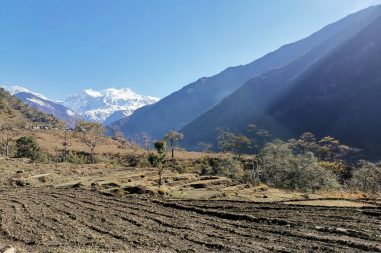 The Annapurna Short Trek is accompanied by blooming rhododendron flowers, sights of endangered animals such as pika, blue sheep, Himalayan Thar, snow leopards and tigers in the lush forests. 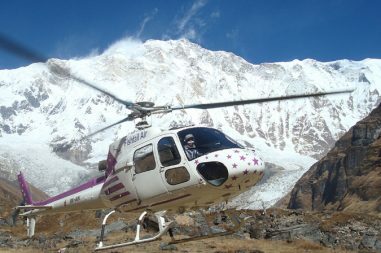 Bharal Adventure always works relentlessly for the sustainable tourism in Nepal. Trekking in Nepal at Annapurna region is the splendid journey and authentic taste of Himalayas. In the Annapurna Short Trek, panoramic views of mountains like Annapurna I, II, III, Annapurna South, Fish Tail, etc. Dhaulagiri, Nilgiri and many other snow clad mountains from Sarankot; a popular vantage point near Pokhara is spectacular. Pokhara is one of the most popular tourist destinations in Nepal. Many tourists visit Pokhara Valley to see the Himalayan range and lakes. Pokhara is also famous for boating, trekking, rafting and extreme sports like rafting, canoying and bungee jumping. Bharal Adventure offers you this incredible short package just in six days. We would be grateful if we could make this short trek one of the most memorable trek of our life. Upon your arrival at Tribhuvan International Airport, you will be received and escorted to your hotel by a representative of Bharal Adventure. In the evening, a stroll around the neighborhood could be arranged. A guided tour around the historically and spiritually significant landmarks in Kathmandu will be scheduled after breakfast. Then we will drive towards pokhara which is the most popular tourism attraction of Nepal. Lunch is provided on the way to pokhara. We will observe the spectacular sunset view in pokhara too after reaching their. We will start our hike to Australian Camp from Dhampuphedi in the morning just after having our breakfast traversing through the dense settlement and rhododendron forested area. Bus drive of about half an hour will take you to the hiking start point. The Australian Camp is situated at the altitude of 1,990m and is considered as the best place to see the glorious view of holy mountain Macchapuchhre (Fish Tail Mountain), Mount Annapurna, Mount Dhaulagiri, etc. It is called Australian Camp because in this place, Australians were the first to set their camps before anyone else. We will be staying at the camp overnight. On this day, we first explore the Australian Camp and interact with the people there, take photos and collect memories to last us for a long time. Then we set out on a hike to Sarankot, which is only a meter high from here. 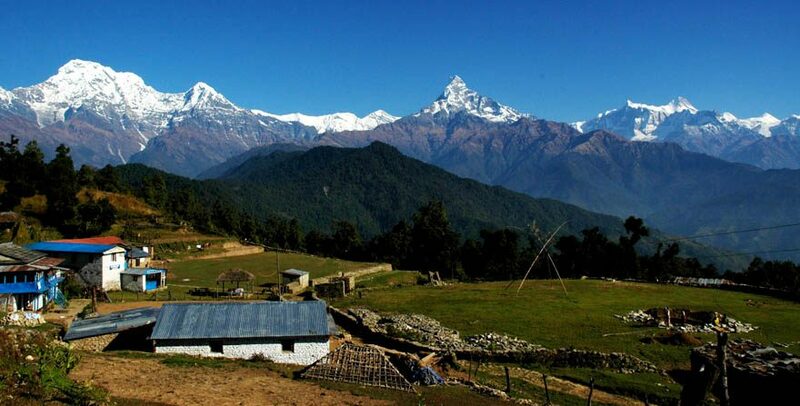 Sarankot is a Village Development Committee in Kaski District in the Gandaki Zone of northern central Nepal and is famous for enchanting views of sunrise and sunset. From here, you can witness the sun glistening in the Dhaulagiri at the northern direction while Annapurna range is also visible during a clear weather day. The beautiful Pokhara city dominates the view in the southern direction. We set out on our trail through forest area to Naudanda just after breakfast. Then, we follow an easy path along hill ridge to a dense settlement where more than one ethnic group resides. We stay here overnight. We wake up early to catch the glimpse of first rays of the sun embraced by the glorious mountains from a view tower that is at the distance of ten minutes walk from the lodge are staying at. We then return back to the lodge, have our breakfast and set off to a drive back to Pokhara where we will spend some time exploring Fewa lake, the famous David’s fall and Barahi temple, then we will set off on our drive to Kathmandu. After the successful trek we Bharal Adventure will take you to the airport, you can do shopping’s and visit some other places too if you want before your departure. Lunch, dinner and breakfast included during the trek. Meals not included in Kathmandu and pokhara. Extra restaurant bill and battery charge etc.